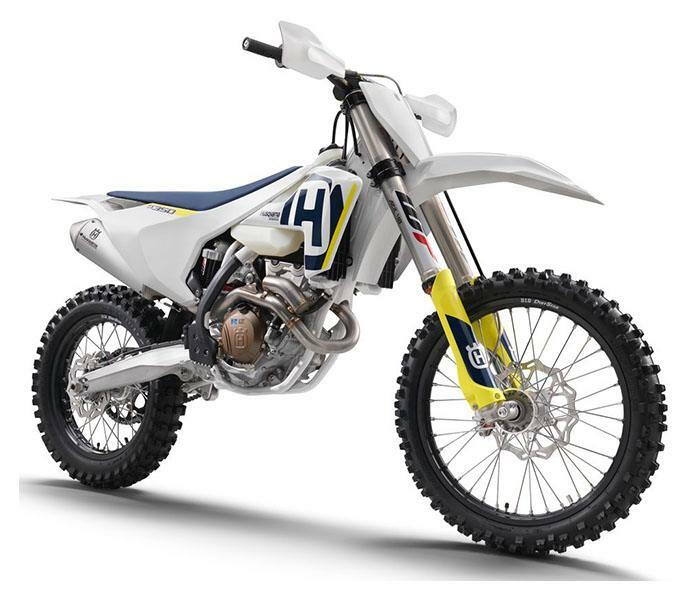 The FX 350 shares much of its engine and chassis architecture with the motocross FC 350, but is tailored for closed course off-road usage. With a maximum output of 58 hp, the FX 350 has a 450 rivalling power-to-weight ratio while retaining the light, agile handling of 250-class machines. This is matched with an advanced electronics package featuring launch control, switchable engine maps and traction control resulting in a versatile, high performance package. Include a 6-speed transmission, larger fuel capacity and an 18-inch rear wheel and the FX 350 becomes the ultimate off road competition weapon. ENGINE: The 350 cc DOHC engine weighs in at only 60 pounds and has a maximum power output of 58 hp. The engine is specifically designed with performance, weight and mass centralization as key criteria. As a result, all shaft arrangements are positioned to allow oscillating masses to occupy the ideal center of gravity while all parts are engineered to offer the best possible performance while adding the least possible weight. CYLINDER HEAD: The FX 350 features the same DOHC design as the FC 350 with polished camshafts and DLC coated finger followers reducing friction and improving overall performance. Added to the design are larger titanium valves (36.3 mm intake and 29.1 mm exhaust) which allow the engine to rev freely to the 13,400 rpm ceiling. CRANKCASE: The FX 350 features an engine design with mass-centralization and weight reduction as the main goals. All the major components are positioned to achieve the best possible center of gravity. As a result, the motorcycle benefits from superb handling while ensuring a light and compact engine design. CRANKSHAFT: A superior quality crankshaft is at the heart of the high output, high-revving FX 350 engine. The plain big end bearing featuring two force-fitted bearing shells ensure maximum reliability and durability, guaranteeing long service intervals of 100 hours. CHROMOLY STEEL FRAME: The hydro-formed, laser-cut and robot-welded frame expertly crafted by WP Performance Systems is specifically designed with calculated parameters of longitudinal and torsional flex. Aluminum engine mountings benefit suspension functionality and feeling while retaining a light, compact and strong package. The frame is finished off with a premium white powder coating and standard frame protectors guaranteeing supreme protection and durability. 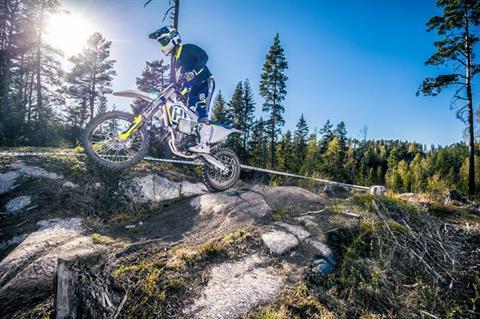 COMPOSITE CARBON FIBER SUBFRAME: The composite subframe is a design unique to Husqvarna showcasing pioneering technologies and innovation. This 3 piece component is made up of 30 % carbon fiber making it remarkably light (1.4 kg) and also particularly strong. Specific care has been taken to create a certain rigidity for optimal handling and rider ergonomics. ALUMINUM SWINGARM: The hollow, cast aluminum swingarm is designed to offer optimal stiffness and reliability at the least possible weight. 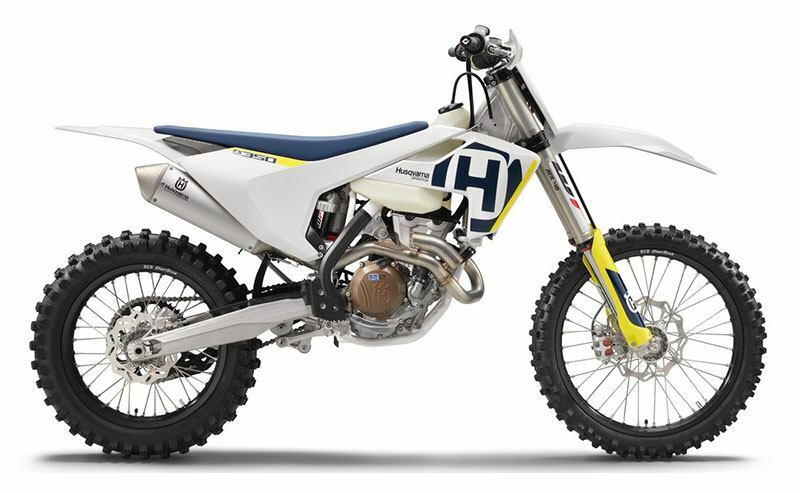 The machining on the side by Husqvarna motorcycle engineers is another mark of quality showcasing in depth attention to detail and superior craftsmanship. 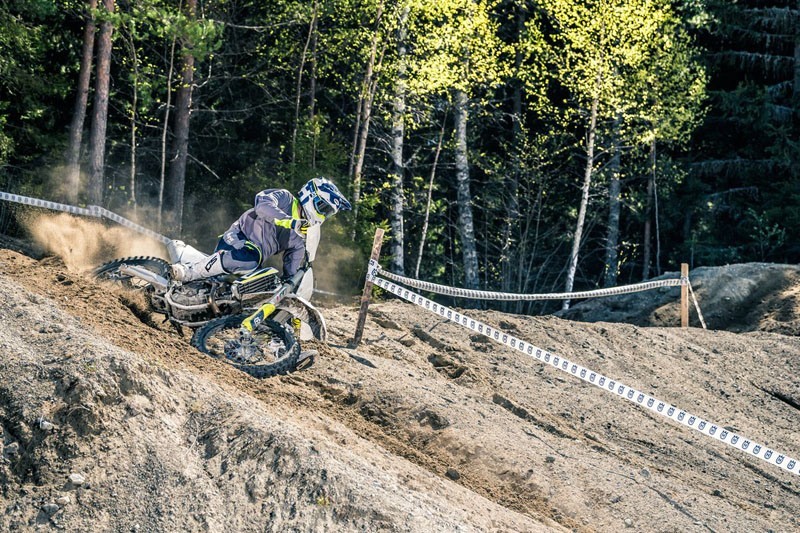 SELF CLEANING FOOTPEG MOUNT: The Husqvarna frame features an innovative, self -cleaning footpeg mount which prevents the build-up of dirt collected through deep ruts or muddy terrain. As a result, the footpeg will spring back into its original position even in the toughest conditions. WP AER 48: The 48 mm split air fork features an insulated air spring and pressurized oil chamber for progressive and consistent damping. The component is lightweight and easily adjustable via a single air pressure valve for pre-load (on the left leg) as well as easy access clickers adjusting damping with 30 clicks (on the right leg). Additionally, the air pump needed to adjust air pressure in the fork will be provided as standard. WP REAR SHOCK: The WP DCC rear shock is designed to provide advanced damping characteristics while conforming to a compact and lightweight design. With a pressure balance inside the shock, damping is improved resulting in greater rider comfort and handling while the outer contour of the reservoir increases cooling. 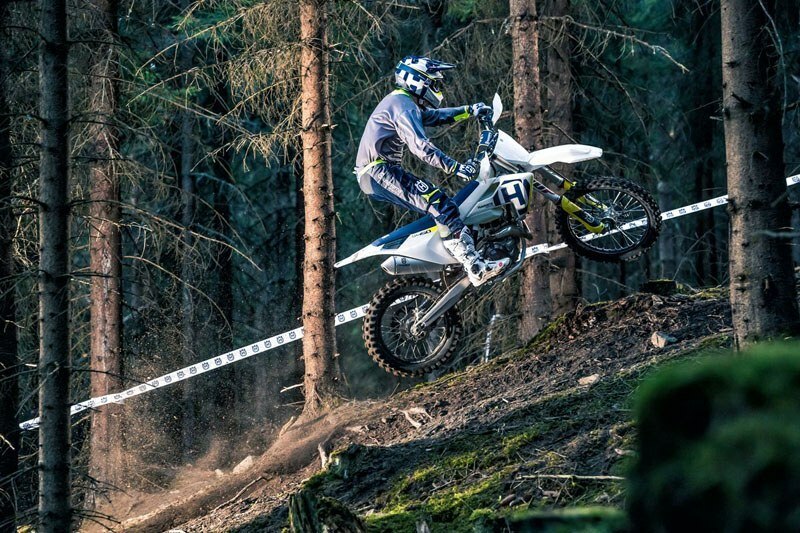 The component is also fully adjustable and matched to a linkage system with a specific geometry to deliver the best possible traction and progression with a rear wheel travel of 300 mm. PRO TAPER HANDLEBAR: The Pro Taper handlebar is second to none for function and style. Manufactured to exacting standards, the Pro Taper handlebar features class-leading fatigue resistance while adding minimal weight. The Pro Taper logos are chemically applied and are scratch and peel resistant. 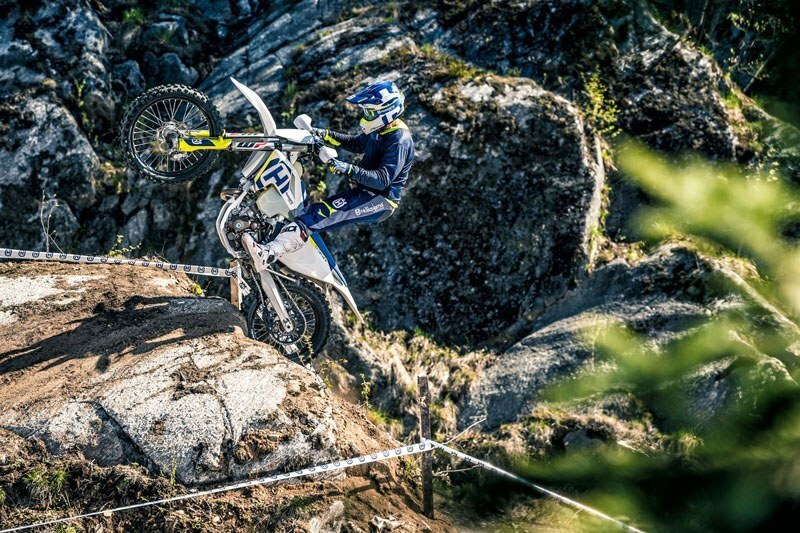 The large Husqvarna bar pad has optimal impact resistance, while the standard handguards offer maximum roost protection. ODI LOCK ON GRIPS: The ODI lock-on grip on the left side does not require gluing, while on the right, the vulcanized grip features an innovative integrated throttle mechanism. The assembly has easy free-play adjustment and, by changing a cam, throttle progression can be altered. MAP SWITCH AND TRACTION CONTROL: Optimised for easy operation, apart from changing between 2 different engine maps, the map switch also activates launch control for perfect starts and traction control for optimal grip in all conditions. 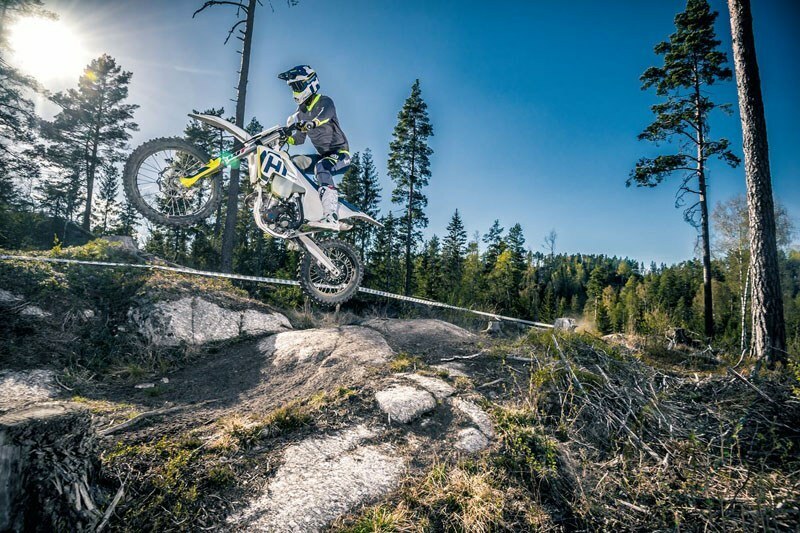 Traction control can be selected to an on or off position from the switch and functions by analyzing throttle input from the rider and the rate at which RPM increases in the engine. If the RPM increases too quickly, the EMS will register a loss of grip and reduce the amount of power to the rear wheel ensuring maximum traction. This can be a distinct advantage in wet or muddy conditions. ELECTRIC STARTER: Along with the benefit of easy starting the electric starting system is combined with a compact Li-Ion battery which is 2.2 pounds lighter than a conventional battery. The wiring harness has been purposefully designed so that the rear subframe can be removed without having to remove any wiring. 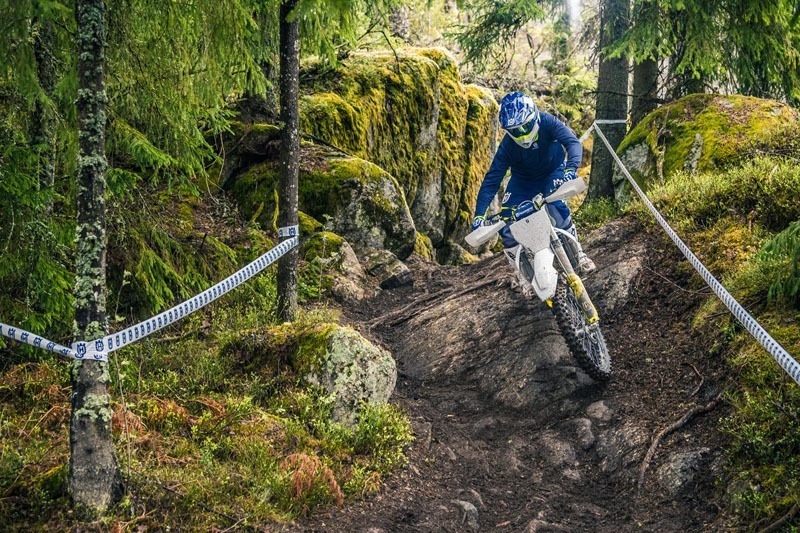 FUNCTIONAL BODYWORK: Modern and functional bodywork in white with traditional Husqvarna blue and yellow accents mark a simplistic yet stylish Swedish design. The ergonomics are specifically tailored to deliver greater control and comfort, enabling riders to perform at the highest level for extended periods of time. The seat has a low-profile and a high-grip cover for superior comfort and control in all conditions. OFF-ROAD SPECIFIC EQUIPMENT: A large 2.25 gallon fuel tank gives the FX 350 the extra range needed for longer loops, while a 6-speed semi-close transmission is perfectly suited for tackling the toughest off-road courses. Both, the 21-inch front and 18-inch rear wheel are fitted with Dunlop AT 81 off-road tires. A side stand completes the off-road transformation of the FX 350. Front - 90 / 90-21 in. Rear - 110 / 100-18 in.